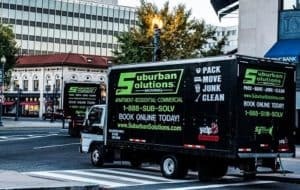 Suburban Solutions strives to be the best apartment movers in Philadelphia, PA. To that end, we offer a number of moving related services with an emphasis on customer service. Our experienced and highly trained movers are here to serve you and provide for your moving needs. Call us for a free quote and to learn more about how we can help you on moving day. Here are some of the highlights of how we make every effort to be Philadelphia, PA’s best apartment movers. For most people, moving day involves many time sensitive tasks and coordination. You may need to be out of your current apartment by a certain time to avoid penalties, and you may need to be at your new place at a certain time to meet with the new landlord who has the key. The last thing you need is for the moving company to arrive late or not at all. Who are not the best apartment movers in Philadelphia, PA? Those are the companies you can’t count on to show up on the right day and at the right time. Suburban Solutions will be where and when you need us. Suburban Solutions is a company comprised of professional movers. We are highly trained in how to successfully move large, heavy, and fragile items. We also follow strict safety standards and protocols. We use professional moving equipment because it’s more efficient, safer for our staff and customers, and protects your precious belongings. We understand that to be the best apartment movers in Philadelphia, PA, we need to use professional grade equipment. That includes our moving trucks. Do I need a Certificate of Insurance when Moving Apartments? It’s common for apartment buildings in Philadelphia to require a Certificate of Insurance (COI). If you are moving in or out of an apartment building, high rise, or a property with building managers, there’s a good chance that the managers of the property require a certificate of insurance for any moving company that works on the premises. Simply ask your building’s management if this is a document they require from moving companies. This is a document that the moving company’s insurance company supplies. The COI verifies that the moving company is insured and specifies conditions that the insurance will be used. The building management wants this document because they know that it is the nature of moving that sometimes property damage occurs. Therefore, if the moving company does damage the building, the management already has documentation to know that the moving company is insured and can pay for the damages if necessary. How do I get a Certificate of Insurance from Suburban Solutions? All you have to do is ask! Our sales managers will request you provide a few pieces of information from your building management which we’ll pass along to our insurance provider. Once we have that information then our insurance company will produce the Certificate of Insurance and email or fax it directly to your building’s management. What happens if I don’t request a certificate of insurance when I book my move, but my building requires one? If you are moving in or out of an apartment building you should always ask your building management whether a moving company certificate of insurance is required. At Suburban Solutions we want to know whether a COI is needed when you confirm your move. We want to be sure that the COI gets in the right hands as soon as possible so that there are no hiccups on move day. If Suburban Solutions is not informed that a COI is necessary, the consequences can be costly. The building management may not let our moving crew start the job without the necessary COI. Our crews then have to wait around for the building, our office, and insurance company to sort out the certificate of insurance. This not only delays your move, but all this wasted time is included in the crew’s chargeable hours, which are charged to you. An optional service we offer that we feel elevates us above our competition and qualifies us to be one of, if not the the best apartment movers in Philadelphia, PA, is our cleaning services. No matter how thoroughly or how often you clean your home, when it is emptied of all furnishings and belongings, there is bound to be dust and some debris. Suburban Solutions is one of the best movers in Philadelphia, PA because we can take care of that for you. We can also pre-clean your new home. Give us a call to find out more. If you are downsizing, cleaning out, or simply want a fresh start, Suburban Solutions can haul away your unwanted items. This is another way we try to be the best apartment movers in Philadelphia, PA. If your unwanted items will benefit a not-for-profit thrift store, we can take them there. If they can be recycled, we’ll haul them to the recycling center. If they need to be delivered to the junkyard, we can do that too. In this way, you can take those tasks off your to-do list which is probably already maximized. Suburban Solutions has partnered with long haul movers to enable a smooth transition between your current apartment and your new home out of state. In our quest to be the best apartment movers in Philadelphia, PA, we have chosen only reputable, dependable long distance companies to partner with us. Did you know that packing is one of the most critical tasks when moving? Few people have the time and organized and ambitious spirit of packing their belongings neatly and safely into boxes. If this is not you, you may not want to take on such a task – especially if you are on a time crunch. Furniture – Sofas, couches, bed frames, mattresses, dressers, desks, cabinets, tables, chairs, and any other furnishings. Our Philadelphia, PA apartment movers can also disassemble furniture that needs to be taken apart and reassemble it in your new home. Any furniture that is unable to be packed into a crate or a box will be covered with protective material or special foam-like pads. Fragile Items – We value your belongings and can provide special crates, including custom built crates, that can be used to move items like mirrors, glass tops, antiques, arts, statues, sculptures, porcelain, and more. All of these items will be packed correctly using various packing materials. Lighting – Whether you have fans, lamps, or crystal chandeliers we can disassemble them from the wall or ceiling, wrap, pack, and transport them carefully to your residence. Clothing – Our apartment movers can help to properly fold or hang clothing and protect it against dirt or damage during the moving process. Tools, Gadgets, and Garage Items – Many households have a garage full of tools and hardware that requires special moving techniques to avoid damage. We’ll organize your tools into the right boxes and pack everything just so to ensure everything is functional when they are taken from the box. Custom Packing Services – Should you have any odd shaped items or very heavy items (i.e. piano, marble countertop, etc. ), our team will be ready to assist you. Moving from one home to another can be chaotic and stressful. It can also be exciting. No matter how many emotions you may be experiencing during your moving experience, having the following checklist to help guide you can ensure that you address everything that needs to be addressed with the help of one of the best apartment movers Philadelphia, Pennsylvania has to offer. Set a date for your move: Pick a tentative date for your move. This will help when you are trying to book Suburban Solutions. This allows you to reserve your date with us as well as give you a timeframe of how long you have to prepare and pack. The busiest times for moving companies are during the summer months, taking place roughly between May 15 – September 15. Near the ends of these months, the volume of shipments is extremely heavy—this tends to be the case for all professional relocation and moving companies.It’s important to take all factors into consideration when deciding on the best time for you to move. If you have some flexibility in your schedule, providing the moving company with a five-day window for loading your shipment can be greatly beneficial. This will allow the individuals who schedule your drivers and moving crew greater flexibility when scheduling your move. If possible, try to be flexible with your arrival time frame as well—keep in mind that you most likely are not the only shipment the truck is currently moving. Offering a flexible time frame can make a world of difference, and make your entire process of moving much easier. Find a legitimate moving company: When you work with us, you know you are getting one of the best apartments movers in Philadelphia, PA. There are far too many scam companies out there who claim to be professionals but are actually in the business of ripping off unsuspecting consumers. Packing preparation: Before you begin to pack, organize all the items you have first. Separate the items you are going to donate, sell, or dispose of. If you are really downsizing, you may want to have a yard sale before you move. You also want to make sure you have the right packing supplies on hand. Certain items require certain boxes. Make sure to have wrapping for fragile items, as well as heavy-duty tape to seal the boxes up. And don’t forget to clearly label each box with the room it belongs in and what is in the box. If the box contains breakable items, write “fragile” in big, bold letters to alert the movers. Transfer utilities: Most utilities request a minimum of several weeks’ notice when you are transferring or setting up new service. Electric, gas, internet, and cable services all require notification from the customer to transfer service. Change of address: Don’t forget to change your address with the post office and fill out a forwarding request so any mail that is addressed to your old address will be redirected to your new home. If you have any regular deliveries, such as magazines, newspapers, or food services, you will also need to let them know about the change of address. How far are you moving? If you are moving to an area that is some distance from your current apartment then there are other services you may need to change. This can include finding new healthcare providers and moving any prescriptions you regularly take to a new pharmacy. If you are moving to a new state, you will also need to transfer your driver’s license and vehicle registration. Pack an essential bag: No matter how organized you are, it is very unlikely you will have everything unpacked your first night in your new home. This is why it is a good idea to pack an essential bag for every member of the family. Pack items such as toiletries, pajamas, one or two changes of clothes, medications, and other items you may need the first few days after moving. And don’t forget to pack an essentials bag for your pet! Avoid packing cleaning solvents, bleach, paint thinner, fertilizer, weapons, ammunition, car or household batteries, full scuba tanks, fireworks, and other flammable items. The aforementioned packing tips are not exhaustive. Do keep in mind that it is easy to injure yourself or pull a muscle just by lifting or setting a box down wrong. If you already have an injury, especially in the knees, hips, back, spine, or shoulders, you should avoid packing and moving on your own. Call us at Suburban Solutions to see for yourself how we try hard to be the best apartment movers in Philadelphia, PA.